By Caravaggio. 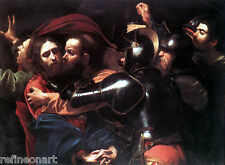 Title: The Kiss of Judas. Material:High Quality Giclee Art print, printed on a gallery-quality and durable canvas.Excellent reproduction of original. Caution: for technical reasons it is possible that the image looks discoloured. Title:The Remorse of Orestes. by William Adolphe Bouguereau. Material: High Quality Giclee Print on Canvas.Other size are available,like 40x60cm,20x30cm and etc. Caution: for technical reasons it is possible that the image looks discoloured. Title:Storm on the Sea of Galilee. Material: High Quality Giclee Print on Canvas. Caution: for technical reasons it is possible that the image looks discoloured. It may appear too light, too dark, or can be of a different hue. US Civil War: Robert E Lee Confederate Army General Fine Art Canvas Giclee Print. High Resolution Giclee Art Print on Real, High Quality Canvas. By William Adolphe Bouguereau. Title:The Birth of Venus. Material: High Quality Giclee Print on Canvas.Other size are available,like 40x60cm,20x30cm and etc. Caution: for technical reasons it is possible that the image looks discoloured. Jesus Christ & Woman Canvas Art Print. High Resolution Giclee Art Print on 100% Real High Quality Woven Canvas. Printed in the USA. High Resolution Giclee Art Print on Real, High Quality Canvas. By Caravaggio. Title： Narcissus. Material:High Quality Giclee Art print, printed on a gallery-quality and durable canvas.Excellent reproduction of original. Caution: for technical reasons it is possible that the image looks discoloured. Lady Godiva Canvas Print. High Resolution Giclee Art Print on 100% Real, High Quality Woven Canvas. By William Adolphe Bouguereau. Material: High Quality Giclee Print on Canvas.Other size are available,like 40x60cm,20x30cm and etc. Title:The First Kiss. Caution: for technical reasons it is possible that the image looks discoloured. Eugene Grasset Three Witches & Three Wolves Fine Art Canvas Giclee Print New. High Resolution Giclee Art Print on Real, High Quality Canvas. Title：Self Portrait With Bonito. Material:High Quality Giclee Art print, printed on a gallery-quality and durable canvas.Excellent reproduction of original. Caution: for technical reasons it is possible that the image looks discoloured.